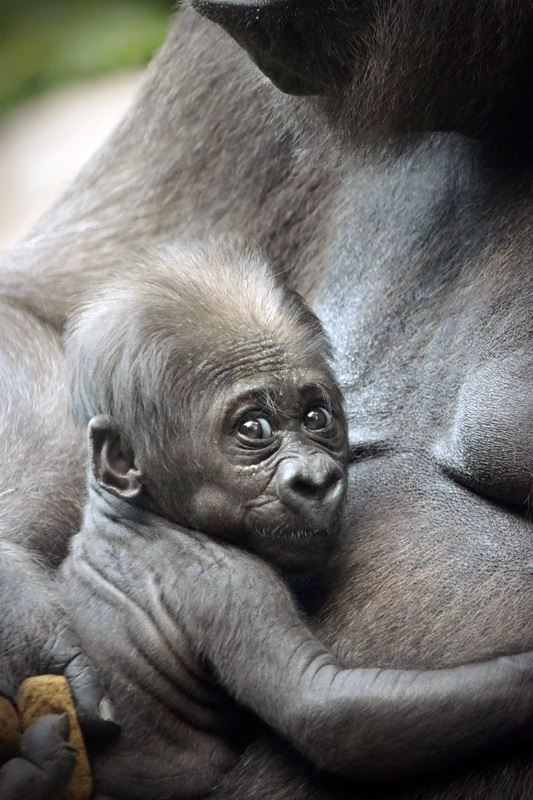 World Gorilla Day: Celebrating gorillas by celebrating our littlest one | Dallas ZooHoo! Baby Saambili’s has grown so much since her birth on June 25, 2018! World Gorilla Day marks the 16th anniversary of the Dian Fossey Gorilla Fund International’s Karisoke Research Center, which is the longest running field site dedicated to gorilla research and conservation. In honor of this special day, we sat down with Assistant Great Ape Supervisor Tamara Jochem to talk about how much baby Saambili has grown since her birth on June 25, 2018. Today is not only about celebrating these magnificent animals – we are also reminded of the very serious threats they face in the wild. YOU can make a difference! Read on to get the inside scoop on all things Saambili and learn a few simple actions you can take to help support gorillas conservation efforts everyday. How much has Saambili grown and changed physically since she was born? We don’t know exact numbers because she’s with mom 24/7. But she has a lot of extra skin that she’s ready to grow into. She also has a little belly and lots of muscles in her arms and legs. She’s a stout little thing! And her teeth started coming in about a month ago. We think she’s got about six teeth on the bottom and four on the top, so far. Will she go through teething, like a human baby? Yep, she will. She’s handling that pretty well, based on our observations. She will chew on her fingers, or anything she can fit in her mouth – lettuce, kale, broccoli – and she might get a bit fussy from time to time. Hope supports Saambili’s bottom while walking on her knuckles. Tell us about the relationship between Hope and Saambili. 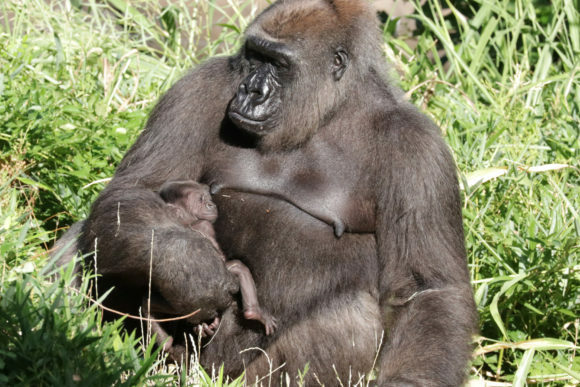 Gorilla babies are born already able to cling, so she’s been able to hold onto Hope’s hair since the beginning. Hope is a very attentive mother, so most of the time she is either supporting or holding on to her baby. She has started to put Saambili’s bottom in her hand, and Hope will walk around on her knuckles. Within the next month or two, we will probably start seeing Saambili start to ride on Mom’s back. Saambili needs a little more strength and coordination for that because the hair on Hope’s back isn’t as long. And eventually Saambili will start to crawl and move around on her own independently. When do we think she might start walking? Right now, she can definitely stand up on her own if she’s holding on to something, so she has the strength in her arms and legs. She wants to crawl, we can tell. But mom is being very cautious and protective. At this point, it’s kind of up to Hope. What kind of interaction has she had with the other members of her family troop at this point? When she was first born, Subira (her dad) immediately came over and inspected her. He put his lips on her very gently, and touched her gently. Periodically, he will come over and look at her. As she gets older and becomes more mobile, that’s when she’ll really start interacting with some of the other members. They may “babysit” or play with her. She may jump around on them, essentially using them as a playground. We’re obviously not to that point yet because she’s still so young. Megan gently inspects baby Saambili. But the other two females has shown a lot of interest in her. Megan has shown the most interest – she’s the youngest in the group, and she’s grown up in family troops her whole life. For the first few weeks of Saambili’s life, Megan was constantly following Hope around because she wanted to look at the baby. And she would hold Saambili’s hand – she’s been very gentle. No, Hope deals with Megan really well. If Megan gets too rough or if the baby needs to sleep, Hope will just move Megan’s hand away or turn her body so Megan can’t see Saambili. Megan is very persistent, so Hope spends a lot of time dealing with that. Luckily, Hope is a very socially-savvy female, so she knows how to handle all of this. Sometimes you’ll see Hope holding Megan’s hand. That’s not necessarily because they’re friends, she’s just saying “stop touching the baby.” What we’re seeing from Megan is a very normal level of interest from a young female, though. And Shanta is very interested in the baby, too – she’s even cleaned her a few times. With Shanta being the lower-ranking animal in the troop, she isn’t able to spend as much time with the baby – although we think she would like to. With Subira, it’s really up to him on what role he’ll play. 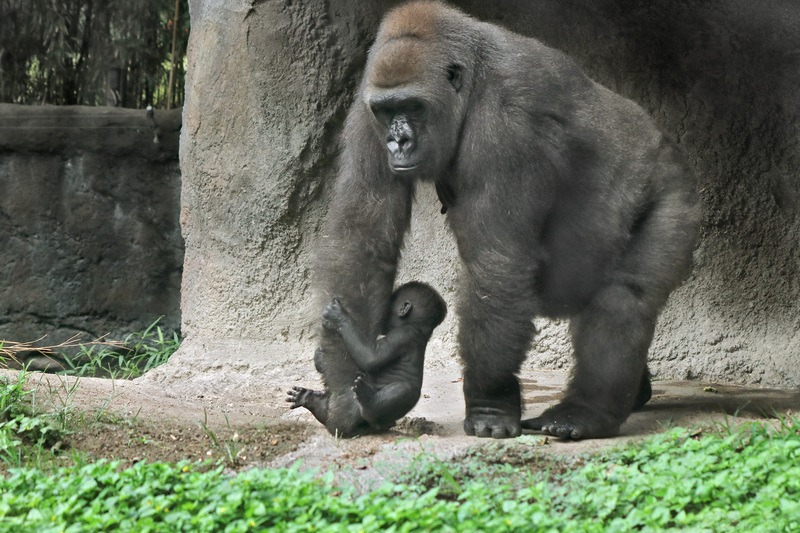 Silverbacks are the protectors of the family, but every silverback is different. A lot times they’re just sort of a jungle-gym. So if they’re napping, the baby might jump onto them from things, hit them, run around, or pull their hair. We suspect Subira will be really tolerant of all those things, which will be oh-so-cute to watch. What is the biggest threat that Saambili’s wild counterparts face? Habitat loss and being hunted for bushmeat. 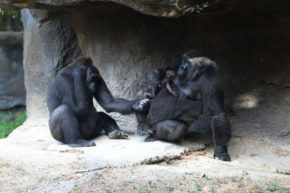 Mining and other agricultural and farming activities are taking away food sources and habitat for gorillas in the wild. And then there’s poaching, where snares are often used. Even if they don’t get caught in a snare, gorillas can lose an arm or die from infected wounds. There are actually some troops in the wild that have learned to recognize snares and undo them, which is great. Baby Saambili is very curious and ready to explore! How can the general public help protect gorillas? Be conscious when you’re buying wood or paper products. Make sure you’re buying rain forest-friendly and sustainable products that are made from recycled materials so you’re not contributing to deforestation. You can also bring your old cell phones, tablets, MP3 players, etc. to the Dallas Zoo, and we’ll recycle them responsibly! These electronics require the mineral coltan, which is mined in Africa – the natural habitat of critically endangered gorillas and other species. Deforestation and mining associated with coltan production have impacted and displaced gorillas, forcing them dangerously close to extinction. Recycling these devices and extending the life of electronic devices (do you really need a new mobile phone as soon as your contract is up?) reduces the demand for coltan mining. For more information on this initiative and how you can help, click HERE.